This recipe was a nice little find that popped up when I was searching for something that included a bunch of items in this week’s CSA box. I modified it a bit to make it a bit lighter and to use what we had on hand — it is super-simple and easily adaptable. 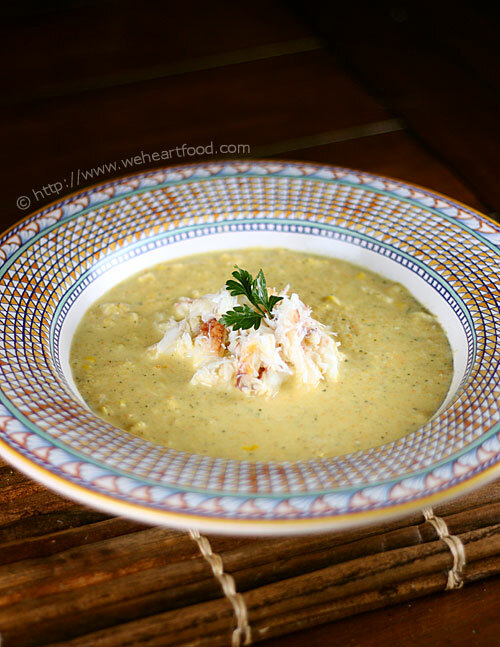 This soup/bisque has a really nice sweet flavor from the corn, and is a great base for a nice pile of delicious Dungeness crab — though you’ll probably want to wait for it to go on sale. That stuff is expensive! Place the garlic in an aluminum foil pocket, drizzle with olive oil, and seal. Meanwhile, in a dutch oven, melt the butter over medium heat. Start dicing the vegetables and add them to the pot, starting with the carrots and working your way through to the zucchini. Saute for about five minutes, and add in the herbs. Once vegetables have softened, add in the broth, reduce to a simmer, cover, and cook for about 30 minutes. While the vegetables are simmering, bring a large pot of water to boil and boil the corn for about three minutes. Remove and let cool a bit, slice the kernels from the cob, and set aside. “Milk” the cob (run the back of your knife down the length of the cob after the kernels are removed to collect the delicious milky corn squeezin’s) and add this to the pot. Once the garlic is roasted and the vegetables have been simmering for 30 minutes, add the garlic and Half-and-Half. Use a stick-blender to puree the vegetables and stock into a smooth consistency — you’ll get texture in a bit. Add the reserved corn and half of the crab meat to the pot, mix well, and simmer for another five minutes. Divide among bowls, and garnish with remaining crab meat.